Oscars, Grammys, they've got nothing on this. Charlie Anderson presents the IBWM Scandinavian Football Awards.....which we've gone and unimaginatively titled 'The Vikings'. We'll get our coat. And our helmets. A small fleet of sleek, opaque limousines. A plush red carpet flanked with flashbulbs and braying television presenters. The glistening clip-clop of high heels on a polished floor. None of these things are related to the following article. This is the 2010 IBWM Scandinavian football awards. 3rd place: A perennially obvious choice, Rosenborg’s landmark unbeaten season in Norway is difficult to ignore. 2nd place: Newly-promoted Haugesund secured sixth place in their first top-flight season for a decade, falling short of a Europa League place but earning a Norwegian Coach of the Year award for 37-year-old Jostein Grindhaug. 1st place: FC Copenhagen swaggered to an eighth league title before almost seamlessly making the step up to the Champions League, seven points from their opening four games bringing them to the brink of knockout-stage qualification. They are also a trifling nineteen points (at the time of writing) clear of the domestic competition this season. 3rd place: Mohammed Abdellaoue almost managed to finish as Tippeligaen top-scorer despite leaving Vålerenga for Hannover midway through the season. That premature evacuation is also the reason he’s only third here. 2nd place: Being a lanky, weary-looking glovesman myself, I have plenty of time for Copenhagen custodian Johan Wiland. Peter Schmeichel, who knows a thing or two about goalkeeping, recently suggested Wiland as a better option for Manchester United than Anders Lindegaard. No argument here. 1st place: Rosenborg’s 4-3-3 can produce some breathless attacking play at times, but it’s somewhat unforgiving on the holding midfielder – namely Anthony Annan. An exemplary and unfussy season from the Ghanaian, whose play generally resembled an ungodly fusion of the Duracell bunny and Optimus Prime. Top marks. 3rd place: Vålerenga’s Harmeet Singh set up more goals than any Tippeligaen player in 2010, assisting eleven of the Oslo team’s astonishing sixty-nine goals. Singh is one of Norway’s brightest midfield prospects and, even more significantly, is just one of many players from immigrant backgrounds to have recently come through the ranks at VIF. 2nd place: Ask a football fan to think of a gangly Swedish goal-glutton of Bosnian descent and they would be unlikely to name Denni Avdić. 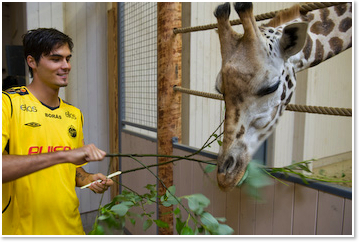 However, the giraffe-feeding striker has been the spearhead of a free-scoring Elfsborg side which finished fourth in Allsvenskan. With just one Sweden cap in a 2009 friendly, Avdić is at the epicentre of a dual-nationality tug-of-war between his home and his country of birth. Only a figurative one, unfortunately. 1st place: Shoehorning Markus Henriksen into conversations unrelated to football is an intricate art. But after watching the teenager establish himself in the Rosenborg midfield this season, it’s difficult not to rave about him whenever possible. The sober positional nous common to Norwegian midfielders, allied to an unusual technical excellence, means that Henriksen’s cap against Croatia is likely to be the first of many. 3rd place: You will find few bigger fans of Morten Gamst Pedersen than yours truly, but his long throw-ins and looping, in-swinging free-kicks to the far post will only get him third place this time. Sorry, Morten. 2nd place: Such is his ability to infuriate people around the globe, his nationality seems almost irrelevant. But Zlatan Ibrahimović is indeed Nordic, and he gets second place here after a La Liga winner’s medal and a thunderous start to the season with Milan. 1st place: Making Paul Konchesky and John Pantsil look good takes some doing. Leading them to a European final is something else entirely. Step forward the greatest Houston-born Norwegian ever to kick a football, Mr Brede Hangeland. No mincing of words on this one. Copenhagen’s Ståle Solbakken is a tactical monolith and, in this humble scribbler’s opinion, one of the top five young coaches in Europe. “It’s not like we’ve lost World War Three. Or World War Two, for that matter.” – Rosenborg coach Nils Arne Eggen explains precisely which world wars his team hadn’t lost when they conceded a late goal to Copenhagen in the Champions League qualifiers. Thanks for that, Nils. A visibly creaking Jari Litmanen looks every one of his sixty-eight years as he buries this splendid effort for hometown club Lahti against Oulu. Take your pick from this merry bunch, but my money’s on this beauty. Not a bad penalty, either. Charlie writes regularly for IBWM, but if you’d like to read more from him please make your way to The Carvalho Peninsula. If you fancy that ‘Harald Berg’ look, there are few retro football shirts as classy as this natty Norway shirt from the 1960′s. Buy one and IBWM will love you forever!